As the pistes begin to get packed down with snow, skiing enthusiasts will be looking forward to their first trip of the season to the slopes. However, although skiing is a hugely popular pastime, failure to prepare yourself before a trip can have a detrimental effect on your body – especially is you aren’t used to physical activity. From your core fitness to the stresses and strains your joints will be subject to, undertaking some basic training will allow you to have a test yourself out on the slopes and have a pain-free trip. Here are the three key areas to take into consideration before heading off on your ski trip, and get yourself prepared to maximise your potential. One of the more common ailments caused by skiing, suffering from joint ache can hamper your time on the slopes if you haven’t undertaken any pre-training. The pain is usually found in the knees, back and pelvis, and is down to the unnatural positioning and stance you need to take when you are skiing. But with a few stretching exercises in the weeks leading up to your ski trip, your joints will become used to the additional strains and you’ll reap the rewards when you’re bombing down the slopes. Lay flat on your stomach, stretching your arms out above your head. Slowly lift your arms and legs off the ground, keeping your neck in a natural position. Ensure you keep your ankles as close together as possible. Hold arms and legs in the air for 30-60 seconds – repeat for three sets. Slowly bend, not allowing your knees to go in front of your toes. Slowly straighten your knees out – repeat for 30 reps a day. Relax your upper body, and stick your bottom up and out. Bring legs together, as if you’re tucking an imaginary tail between your legs. Bend your knees into a skiing positioning, keeping your upper body straight. Do 30 reps a day, until the movement feels natural. Your quadriceps (the front of your thigh) and gluteal muscles (the back of your thigh) play an integral part in providing the power you need when you’re skiing. Helping support your knee joints and control them when in a bent, or skiing, position, your quads work in two ways when on the piste. Your glutes, on the other hand, help support your lateral hip muscles – these muscles mustn’t be neglected during your training, as skiing is heavily reliant on external hip rotation when turning. It’s easy to think that your skis will do all the work for you and no cardiovascular fitness is required when you’re heading down a slope – but you’d be wrong. 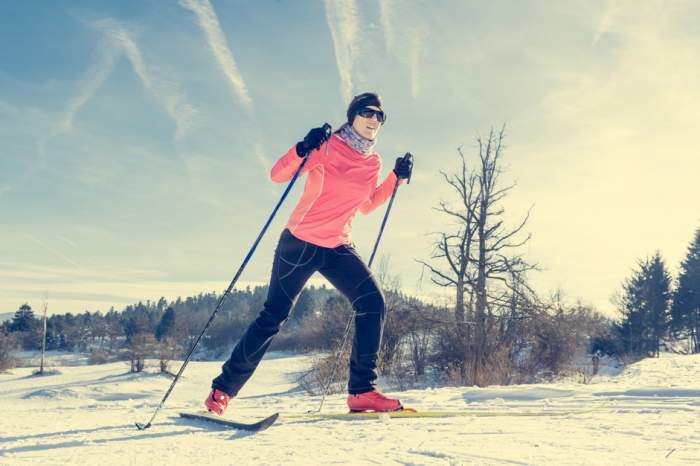 Yes, a lot of training should be based in getting the right alignment, through loosening your joints and strengthening your legs, however adding some fitness into your pre-ski trip plan will benefit you once you’re out there. To truly enjoy a snow-fuelled active holiday, ensure your body is fully prepared to tackle the slopes when you head off on your skiing trip this winter.